Travis Ishikawa hit a three run walk off home run in the bottom of the ninth, to give the Giants the 6-3 victory over the Cardinals. The Giants are heading to their third World Series in five years. They won their prior two appearances in 2010 and 2012. 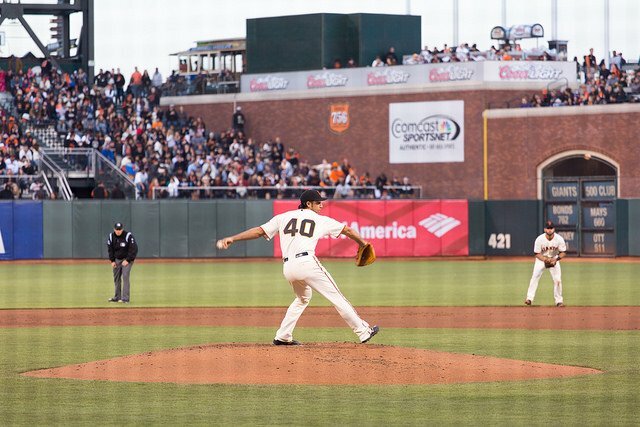 Madison Bumgarner pitched a gem for San Francisco, giving up three runs in eight innings. Bumgarner was named the MVP and pitched 15 2/3 innings in the series, giving up three runs on 12 hits. Adam Wainwright got the no decision, pitching seven innings and giving up two runs. I think St. Louis manager Mike Mathney would have been better off sticking with Wainwright in the eighth. Pat Neshek came into pitch the eight and that is when it went south for the Cardinals. Neshek gave up a home run to pinch hitter Michael Morse, to lead off the innings. That home run tied the game at three. The Cardinals had two homers in the game off the bats of Matt Adams and Tony Cruz, who was Yadier Molina replacement. Once Molina went down this was a very different team, and you have to wonder if the series would be heading back to St. Louis, if he had been able to play. Jon Jay had another great game, going 2-4 with a double. In the top of the ninth the Cardinals had the bases loaded and where unable to score. They left a total of six runners on base and where 1-6 with runners in scoring position. St. Louis sent Michael Wach to the mound to pitch the bottom half of the ninth. Wacha, was making his first appearance this postseason and I think that it was a huge mistake to put him in with the season on the line. Pablo Sandoval led off the inning with a single. Wacha was able to get an out, but he followed the out with a walk to Brandon Belt. That allowed Ishikawa to bat and you know what happened next. You could tell Wacha was trying to avoid walking Ishikawa and just made a flat out mistake leaving the pitch right down the middle of the plate. As soon as it left his bat you knew the game was over, it was either going to hit off the big wall out in right field or head into the bleachers. Ishikawa’s home run was the first ever game-ending homer in NLCS history. Most people recall one of the most famous homers ever and another home run that sent the Giants to the World Series. Bobby Thomson’s “Shot Heard Around the World” that clinched the National League Pennant for the Giants. The Cardinals may have a tougher time to get back to the playoffs next season, with the continued improvement of the Pirates and the Reds getting back to full health. St. Louis should still be in the race, but I don’t think that the team they have now are capable of winning another division. Their division is just to talented, and this team was lacking in the power department most of the regular season. Look for them to bring in a big bat and add some pitchers for their bullpen. The Giants will take on the Royals in Kansas City, Tuesday at 8:00 PM ET on Fox. If I had to guess the Giants will start Madison Bumgarner, who has plenty of time to rest up. James Shields, will more than likely be on the mound for Kansas City.